Followers of my Instagram already know that I spent last week in Zanzibar at The Residence. I'd wanted to go since a press breakfast with the hotel a year ago, so finally arriving felt incredible. I'd only ever been to South Africa before but my parents and sister had been (and travelled quite a lot of East Africa) and cited it as their favourite place. Have to say I agree, and I'll be posting lots of content from there over the next few weeks. Here I am on our first evening..
To explain the bike, the hotel is made up of individuals villas spread out across the coast so you need to cycle to get about. We shot this on the way to our first dinner on the island which was really rather special. We ate fresh lobster on the beach with little lights hanging from the palm trees (and drank all the bubbles). This is a typical "me on holiday" outfit. I'm not really a "dressing up for dinner" person so I look for comfortable pieces that'll work over and over again. I try to let the accessories be the interesting part... I do love a fancy earrings and this mismatched pair (the other ear has a gorgeous gold pineapple charm) are from Net A Porter, a gift as part of their #jetaporter campaign here. The shorts were a star buy from ASOS before I left, here. They're from Levi and I went a size up which was lucky because I had to pour myself into them. However it's totally worth it as (with all Levis) once I'd worn them for an hour they stretched to exactly how I wanted them. I wore them constantly whilst I was there and know I will at home too... Find them here. 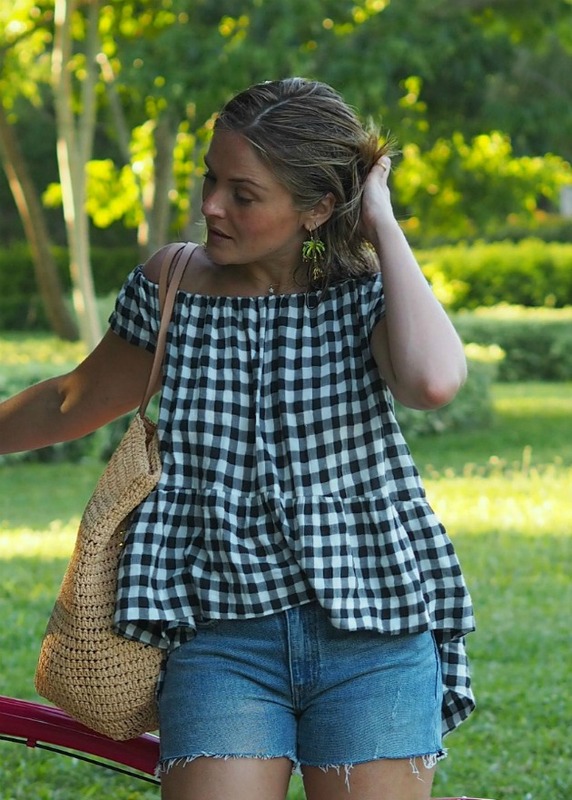 Now, the gingham top. I've actually has this for a while and have been meaning to post about it for ages. It's from Other Stories which has my favourite summer collection so far (discover it all here, and also check out Whistles here which is a close runner up for the title). Quite a few of us bloggers have it and for good reason; it ticks so many boxes in terms of current trends but is so damn comfortable. It's also fabulous for big feeds as it hides a multitude of greed-based sins. Find it here. Gingham is most definitely having it's moment and this isn't the first piece I've succumbed too. You'll see quite a lot of it on the blog in the next few months as I just ordered in a lorry load. I've had this ASOS jumpsuit ages ago but have been waiting for the right weather. Above is a list of my favourite bits - this dress is firmly on the list and plan to wear with a shirt under in the week and with denim jackets and sliders on weekends. Carrying on the whole "punchy accessories" vibe, the shoes were an unusually spontaneous purchase from Zara the week before we went, here. I rarely buy shoes from them as they aren't always the best for my feet (I'm being kind; Zara shoes have been known to skin my hooves to death leaving me unable to walk for days on end) but these have been great. I'm really excited to wear them with a new maxi dress I just ordered from The Outnet (here if you can't wait for the inevitable Instagram) which is blue and white striped. Only other thing I'd added would be pair of oversized sunnies, and maybe the market-bag from J Crew here, as pictured in this outfit. You'll see a lot more of my holiday style posts on the blog in the coming weeks, but a few will be Instagram only so do make sure you give me a follow here. Changing the subject massively, but I feel as a Londoner I can't not mention the attack last weekend. We arrived back from an incredible holiday in an incredible (Muslim) country to news that extremists had stormed London Bridge, killing and injuring over 50 people. I am just so sorry to all those affected, but lets not let this stop us. I hope you and your loved ones are well and that this brings more people together than it does tear people apart. These photos were taken at The Residence Zanzibar, who kindly hosted us. Photographs taken on the Olympus PL7 here their 45mm lens here. Perfect summer look. Love the shoes!